Please refer to our stock # S0001 when inquiring. Wonderful Antque silver serving folk crafted by important NYC silver shop of George and Nathan Platt. Their shop lacation was located in New York City at 140 Chatham Street. They worked together at this location from 1828 - 1836. 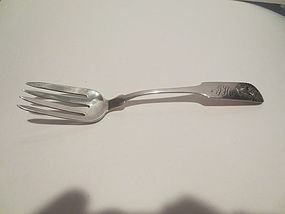 This fine coin silver serving spoon measures 8 5/8Z" in length and weights 33 dwts (pennyweights). It features a two handeled urn with flowers. This fine example of the Pratt's craftsmanship is in fine condition and would make a great addition to an antique American coin silver collection.